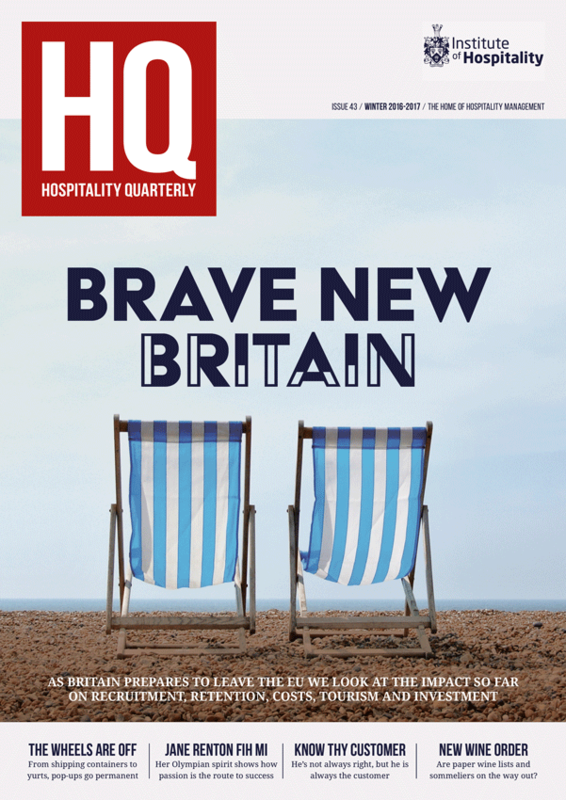 The article was originally published in ‘HQ‘, the members magazine of the Institute of Hospitality. 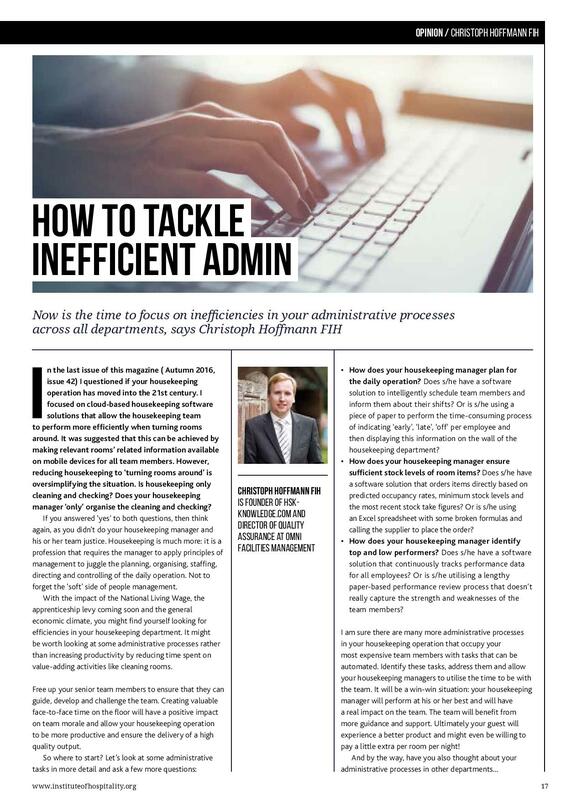 Now is the time to focus on inefficiencies in your administrative processes across all departments, says Christoph Hoffmann FIH. In the last issue of this magazine ( Autumn 2016, issue 42) I questioned if your housekeeping operation has moved into the 21st century. I focused on cloud-based housekeeping software solutions that allow the housekeeping team to perform more efficiently when turning rooms around. It was suggested that this can be achieved by making relevant rooms’ related information available on mobile devices for all team members. However, reducing housekeeping to ‘turning rooms around’ is oversimplifying the situation. Is housekeeping only cleaning and checking? Does your housekeeping manager ‘only’ organise the cleaning and checking? If you answered ‘yes’ to both questions, then think again, as you didn’t do your housekeeping manager and his or her team justice. Housekeeping is much more: it is a profession that requires the manager to apply principles of management to juggle the planning, organising, staffing, directing and controlling of the daily operation. Not to forget the ‘soft’ side of people management. With the impact of the National Living Wage, the apprenticeship levy coming soon and the general economic climate, you might find yourself looking for efficiencies in your housekeeping department. It might be worth looking at some administrative processes rather than increasing productivity by reducing time spent on value-adding activities like cleaning rooms. Free up your senior team members to ensure that they can guide, develop and challenge the team. Creating valuable face-to-face time on the floor will have a positive impact on team morale and allow your housekeeping operation to be more productive and ensure the delivery of a high quality output. How does your housekeeping manager plan for the daily operation? Does s/he have a software solution to intelligently schedule team members and inform them about their shifts? Or is s/he using a piece of paper to perform the time-consuming process of indicating ‘early’, ‘late’, ‘off’ per employee and then displaying this information on the wall of the housekeeping department? How does your housekeeping manager ensure sufficient stock levels of room items? Does s/he have a software solution that orders items directly based on predicted occupancy rates, minimum stock levels and the most recent stock take figures? Or is s/he using an Excel spreadsheet with some broken formulas and calling the supplier to place the order? How does your housekeeping manager identify top and low performers? Does s/he have a software solution that continuously tracks performance data for all employees? Or is s/he utilising a lengthy paper-based performance review process that doesn’t really capture the strength and weaknesses of the team members? I am sure there are many more administrative processes in your housekeeping operation that occupy your most expensive team members with tasks that can be automated. Identify these tasks, address them and allow your housekeeping managers to utilise the time to be with the team. It will be a win-win situation: your housekeeping manager will perform at his or her best and will have a real impact on the team. The team will benefit from more guidance and support. Ultimately your guest will experience a better product and might even be willing to pay a little extra per room per night!